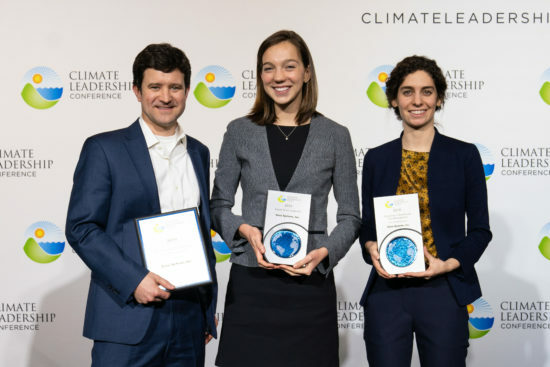 We are proud to announce that Cisco won three 2019 Climate Leadership Awards from The Center for Climate and Energy Solutions (C2ES) and The Climate Registry (TCR), two for excellence in greenhouse gas (GHG) management and one for supply chain leadership. We believe more than ever that what’s good for the world is good for business. This recognition demonstrates our commitment to addressing climate change—from the facilities we manage to the suppliers who partner with us. We’ve taken a holistic approach to help protect the planet, and it’s working. To reduce the GHG emissions in our internal operations, we’re aggressively increasing our use of renewable energy, which currently accounts for 82% of our electricity use worldwide. We generate our own renewable electricity onsite in India, Texas, Massachusetts, and North Carolina, and engage with local energy suppliers to purchase renewable energy where possible. We also continue to implement hundreds of energy efficiency projects across our real estate operations through our EnergyOps program. These projects reduce our energy use and GHG emissions while contributing to Cisco’s bottom line. Additionally, we are working on a comprehensive program to green our campus in Raleigh, focusing on 100% renewable energy, zero waste, and water neutrality. In total, we have reduced our absolute Scope 1 and 2 GHG emissions by 45 percent compared to our FY07 baseline. Our supply chain team works with our manufacturing partners to pursue verifiable energy saving targets through the digitization of factory activities. We also design our packaging to minimize weight and volume, maximizing transportation efficiency and reducing material use. So far, we have avoided more than 910,000 metric tons of supply chain-related emissions, putting us well on track to achieve our 2020 goal. Additionally, we have made some exciting progress in our circular economy program. We are focused on decoupling growth from the consumption of finite resources, designing waste out of the system, and transitioning to renewable resources. Our holistic approach extends from how we design, build, and deliver products and solutions, to how we value the assets we have and turn those assets into new products. We are also applying Cisco technology to support our customers through their own circular transformations. It is an honor to be recognized as a leader for our progress in climate action across our operations. These achievements would not have been possible without the hard work and dedication of our Operations team. We are proud to work for a company that is invested in making the world a better place for generations to come. For more information, please check out our latest CSR Report.